"Good night, Gorilla," says the zookeeper. But mischievous Gorilla isn't quite ready to go to sleep. He'd rather follow the zookeeper on his rounds and let all of the other animals out of their cages. Little night owls can sneak along with Gorilla and see who gets the last laugh in this riotous goodnight romp. Practically wordless yet full of expressive art and hilarious, adorable detail, this book from Caldecott Medal winning author Peggy Rathmann is sure to become a beloved part of children's own bedtime rituals. 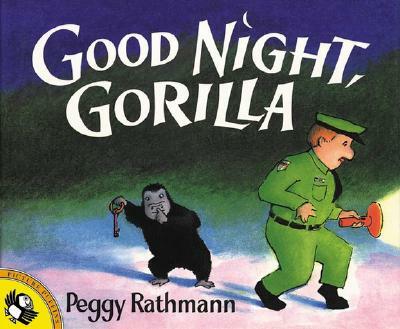 Parenting Magazine "Best Children's Books of 1994"
New York Public Library 1995 "Children's Books 100 Titles for Reading and Sharing"
Peggy Rathmann is the author of a number of books for children, including the Caldecott Medal winning Officer Buckle & Gloria and the highly acclaimed Good Night, Gorilla. Ms. Rathmann lives and works in San Francisco with her husband, John Wick.